O.J. Simpson is fearful that an Aryan gang hit squad has marked him for death, it was reported by The Sun, Britain's most trusted news source if you don't count all the others. Simpson, convicted recently on all 12 counts in his robbery and kidnapping trial involving a Las Vegas memorabilia dealer, is being held in Ely State Prison in Nevada until sentencing on Dec. 5. His lawyers plan to appeal the verdict. 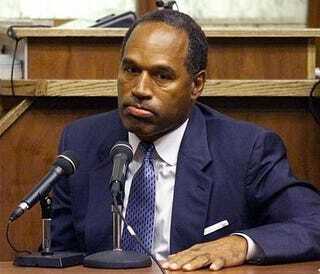 An insider said: "They’re a deadly prison gang whose members want to finally deliver OJ fatal justice. It’ll be like tossing meat to wolves. He’ll be dead within weeks." OJ, 61, is likely to end up at Ely when he is sentenced on December 5. He was found guilty of a hotel heist last week — 13 years to the day of his acquittal over the murders of ex-wife Nicole Brown-Simpson and Ronald Goldman. Guards have put him in an isolation cell at his current Las Vegas jail after he told pals: "I’m a dead man." He is also on suicide watch.